As I write it is March 25th, which was the date of New Year in Great Britain and its colonies until 1752. Indeed, throughout history it was a common date for the start of the civil year in a wide range of European states and principalities, being the traditional date of the vernal equinox, and so the beginning of the seasonal year. On top of that notable calendrical event, yesterday (March 24th) seems to have slipped by without people recognising that according to the mnemonic (Easter is the first Sunday after the first full moon after the vernal equinox) it should have been the date of Easter, if strict astronomy were followed. Here I explain why it was not (the date of Easter this year). Being a bit of a tragic when it comes to calendars, I must write a blog post today to wish everyone a Happy New Year! — March 25th marked the start of the year in Britain and its colonies until 1752 (okay, before the claiming of Australia and New Zealand, but certainly the case in the erstwhile American Colonies). This is the reason why the personal tax year in the UK still begins on April 6th (though the reader is urged to be cautious in pondering why that might be). Why 1752? Because from that year Britain gave up its resistance to coinciding with the Gregorian calendar (it was formerly using the Julian calendar, but with March 25th as the beginning of the civil year), and instead fell in line with much of the rest of Europe. Strictly, using January 1st to start a calendar year was not part of the Gregorian reform, and that date had been adopted earlier elsewhere in what is now the UK (from 1600 in Scotland), but the British legislation (known as Lord Chesterfield’s Act) made it clear that the intent was indeed a unification of the dating systems used in western Europe. A quick example of the consequences… Many history books will tell you that Queen Elizabeth I died in 1603. In fact she died on the last day of 1602 (i.e. March 24th). It would not be correct to say that she died on March 24th in 1603 on the Gregorian calendar, because in fact there was in that era a ten-day difference, so her passing occurred on April 3rd 1603 (Gregorian). The percipient will now be wondering how that correlates with the tax year starting on April 6th (as mentioned above); I am going to leave that as a puzzle here, but will respond with the answer if anyone would like to add a comment below. There are many other examples of confusion introduced by these apparent calendar anomalies. Shakepeare and Cervantes may have died on the same date, but ten days apart. The insurrection in 1917 in Russia often termed the October Revolution in fact occurred in November. The Washington’s Birthday holiday in the United States is stated to stem from his birth on February 22nd 1732; it is observed on a date between February 15th and 21st inclusive (the third Monday of the month), which seems too early; but in the Washington family bible on display at Mount Vernon it says he was born on February 11th 1731, as indeed he was. To save confusion (at least to some extent) it is usual to label dates in the British domain across the seventeenth and eighteenth centuries (at least) as being O.S. or N.S. — Old Style or New Style. The mnemonic for when Easter occurs is that it is “the first Sunday after the first full moon after the vernal equinox”. This year the equinox occurred at 21:58 UTC on March 20th; the full moon was at 01:43 UTC, three hours and 45 minutes later; and so one might have expected Sunday March 24th to have been allotted to the marking of Easter (regardless of whether one defined ‘Sunday’ in terms of the prime meridian being that of Jerusalem, Rome, Greenwich or Washington DC). Instead Easter Sunday occurs four weeks later. So, what is going on? Things get even more confusing if you consider that April 21st is the date of Easter only on the Gregorian calendar, using the computus (the computation method) for that ecclesiastical system. For the Julian calendar/computus, as still used by various Orthodox churches and others, the date this year is April 28th Gregorian, which is April 15th Julian. Easter this year therefore appears anomalous, although it does conform to the wishes of the Nicene Fathers, who first laid down the rules for Easter in AD 325, their primary desideratum being that Christianity be differentiated from Judaism, and therefore that Easter and Passover should not coincide; this year Passover is on April 20th (Gregorian). A useful brief account of arguments about reforming how Easter is calculated is given in the relevant Wikipedia page, but be warned that this is a hugely complicated matter about which a vast amount has been written, including by me. 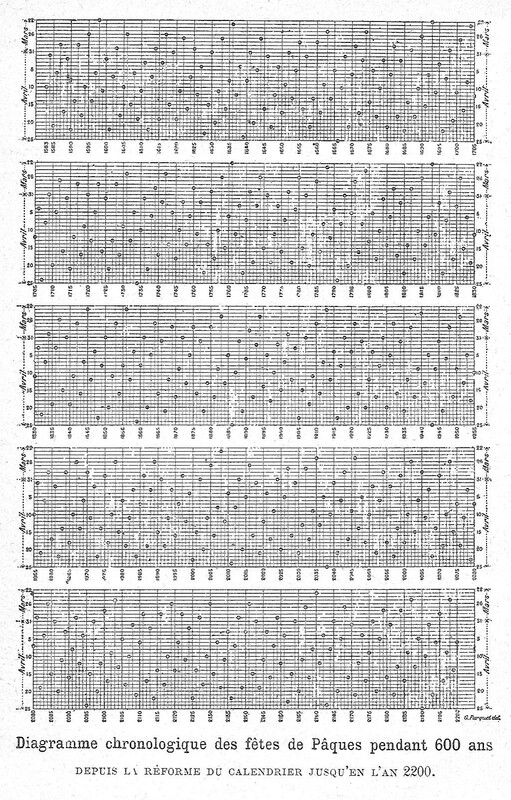 The reality of the Gregorian computus is that it is hugely complicated (e.g. see the account in this 1923 article); and also, for reasons that I will explain in a later post, a second-best solution even to the basic problem of defining Easter according to pre-determined tables. 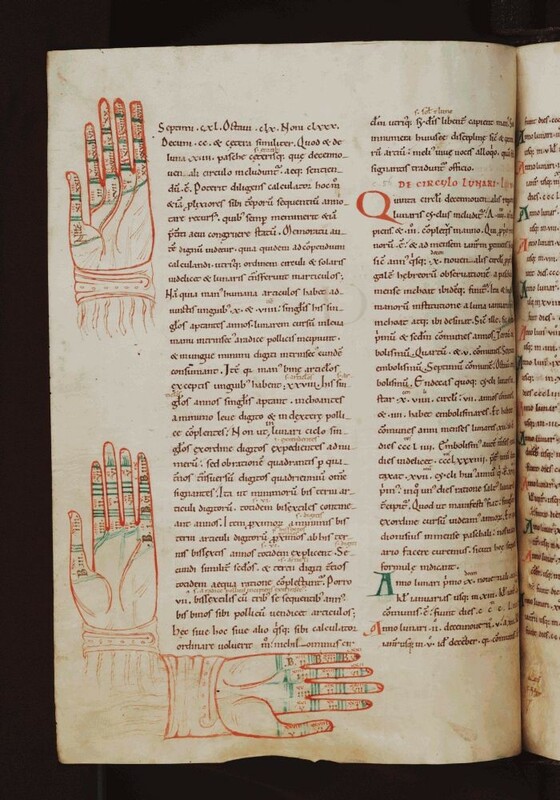 The earlier Julian computus was less complicated, but less accurate, hence the idea of counting on your fingers as depicted in the graphic at the head of the present post, which I obtained from this lovely little article on the British Library website, written by Taylor McCall. Another example of fingers being used in this manner appears at right. This photograph is of a page in a volume held by St John’s College, Oxford (where, it happens, my elder son is a student, just completing his DPhil thesis I hope), and I obtained it from another excellent online article, this one by Irene O’Daly. Let’s consider just the hand at upper left, and in particular the parts of the digits between the green lines. There are four for each of the fingers, and three for the thumb, making 19 in total. The reason is that 19 is an important number in the Easter computus, because the Metonic cycle lasts for 19 solar years, this being very close to 235 synodic months in duration, a fact that was known even before the time of Meton of Athens two-and-a-half millennia ago. 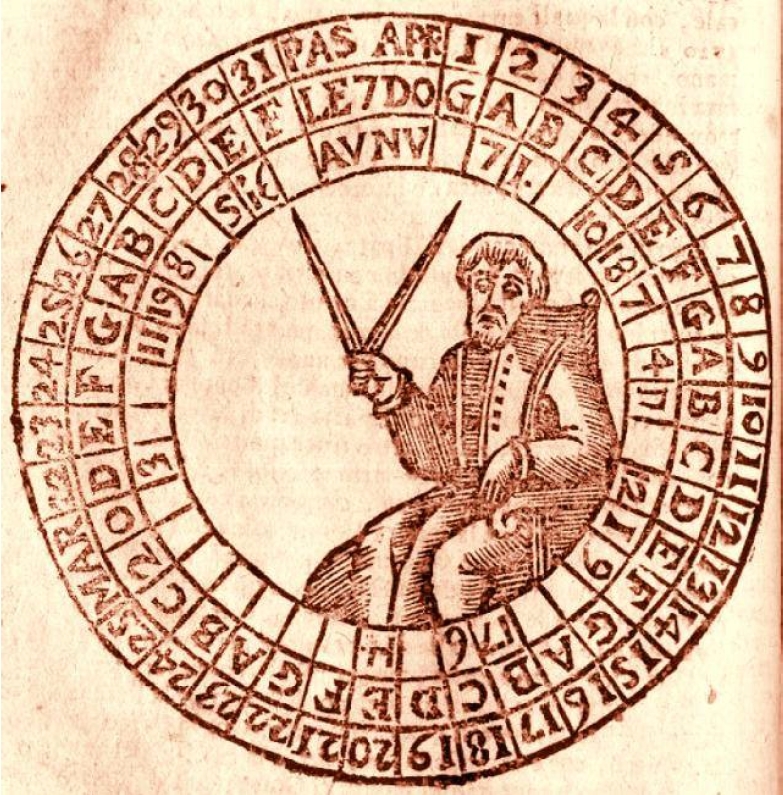 That is, this mediaeval tract is indicating how to use not just the five digits, but also the number of bones in each, to do reckoning related to the occurrences of Easter. In later times mathematicians and theologians found other ways to do ‘ready-reckoning’ for the date of Easter. The diagram below is taken from the 16th-century Almanacco Perpetuo of Rutilio Benincasa. Note that the outermost circle contains the range of possible Easter dates (March 22 – April 25), and the second circle contains letters from A to G repeated: the Dominical Letter, which I describe later below. The innermost circle has boxes containing nothing in many cases, but symbols in 19 of them. The Metonic Cycle again? Yes, though in a way that is complicated, of necessity. Of course, as time went by we became more proficient at making suitable calculations. The table at right shows the dates of Easter for more than six centuries, starting from 1583 (the first Easter after the Gregorian reform of the calendar, itself predicated on regularising the Easter computus) and stretching through to 2200, so it is not out of date yet! This was drawn up by Camille Flammarion (1842-1925), a French astronomer who was a prolific writer. At this juncture I might pose another puzzle for readers to ponder (and in this case I will give the answer* below): How long in years is the cycle over which the Gregorian computus results in a repeat of the pattern of Easter dates? Whilst making such calculations might be straightforward now, with electronic computers, in Flammarion’s day it was not so simple. Strasbourg Cathedral is famous for various things, including its magnificent clocks. 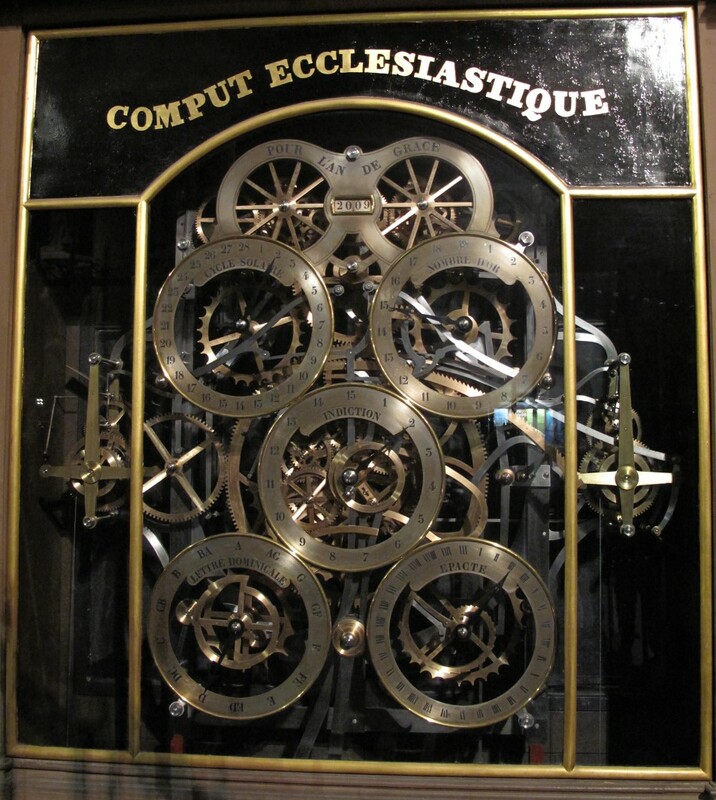 The ‘third clock’ was constructed between 1837 and 1843, and it includes a specific display of dials that relate to the Easter computus (or, as the photograph below indicates, the Comput Ecclesiastique). In essence this part of the clock is a mechanical calculator, set up specifically to follow certain arithmetic operations that are defined by the rules laid down by the Roman Catholic Church in 1582 for the stipulation of when Easter Sunday is to occur in perpetuity. This photograph (at left) was taken in 2009, as indicated by the digital display at the top. The dial at top left indicates the Cycle Solaire for the year, a number between 1 and 28, this being due to there being seven days in a week and four years in a basic leap-year cycle. (This also answers the question of How long must I keep this gorgeous printed wall calendar before I can use it again? with the answer being 28 years unless that interval bridges a century year which is not leap [i.e. 1900, 2100, 2200…]). At upper right is the Nombre D’Or, or Golden Number: a year has a value between 1 and 19 in accord with the Metonic Cycle. At lower left is the Dominical Letter: the letter attached to the first Sunday of any year given that January 1st is an A, except that in a leap year a letter is leaped on March 1st (hence the origin of the term ‘leap year’). This means that there are 14 possible values, as shown, half with two letters: one for January 1st to February 29th, the other for dates from March 1st onwards. Note that a small table of Dominical Letters features in the manuscript page at the head of this blog post. At lower right is what is known as the Epact, a number taken from a table that may or not be changed in any century year subject to strict rules, and behind which lies a whole heap of confusion (even on the part of the designers of the Gregorian calendar, who appear not to have recognised the distinction between a solar day and a tithi). I will explain more about the table of epacts, when both you (dear reader) and I have a week or two to spare. For now, suffice it to say that the epact for any year is a value for the age of the ecclesiastical moon (not the real Moon in the sky) on January 1st, and it is this ecclesiastical moon that defines the ‘full moon’ in the mnemonic for Easter. Similarly, as I have recently mentioned elsewhere, the definition of the ‘equinox’ in that mnemonic is not the vernal equinox as defined by astronomers, but rather the ecclesiastical equinox, that being defined to be the whole of March 21st. In the middle of the display is a dial labelled Indiction. I do not know why it appears on the Strasbourg clock in that it does not form a part of the Easter computus, although it is used in the derivation of what is called the Julian Date (which has nothing, really, to do with the Julian calendar). The Indiction was a 15-year taxation cycle introduced by the Romans, which continued for many centuries. It may have been included in the Strasbourg clock as a little protest against the fact that the Indication was eventually discontinued in 1806 (30-odd years before the clock was built) by Napoleon Bonaparte, when he effectively abolished the Holy Roman Empire. *The answer is 5,700,000 years. Please submit a comment if you really want me to explain why.